Modern Marketing Partners was recognized as a top business-to-business agency by BtoB Magazine in its March issue. Founded in January of 2012, Modern Marketing Partners is extremely proud to receive this honor after it’s first year of operation. The 2012 Top Agencies report by BtoB magazine includes four categories: Small agencies (revenue up to $10 million); midsize (revenue between $10 million and $99.9 million); large (revenue of $100 million and up); and interactive agencies. The finalists in each category were selected based on percentage of total business that is b-to-b, revenue growth, new client wins, innovative work and expanded service capabilities. 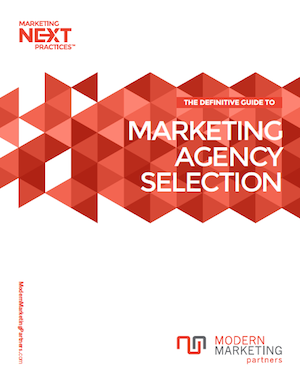 Modern Marketing Partners was distinguished as a top small agency in the magazine’s special report dated March 4, 2013.